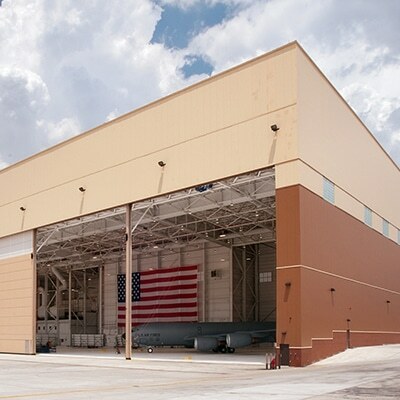 We’ve delivered some of the largest and most complex aircraft hangars across the country, including maintenance and mission-critical hangars for both the Department of Defense and the private sector. They’re some of the toughest jobs in our industry, from sophisticated electronic systems and ultra-heavy loads to extensive quality and security control protocols. And we’ve earned a reputation for nailing every last detail. Designing and building a USGBC LEED-Certified Silver aircraft hangar capable of accommodating four KC-135s is no small task. The tolerances associated with a 400-foot wide hangar door are extremely small and require a highly capable team with the right experience and skill set. We know this because we’ve done it. We’ve also installed hundreds of thousands of square feet of airfield pavement with the same level of minimum tolerance requirements. From heavy-duty concrete piers to rapid-fill foam fire protection systems, every component of the project is designed to meet or exceed our clients’ requirements and expectations, without exception. When building in the proximity of aircraft, especially jet aircraft, safety and quality control is critical. We go to great lengths to prevent Foreign Object Debris (FOD) hazards, in or around the jobsite, including extensive FOD training, vehicle inspections and comprehensive enforcement program. We’ve developed the most rigorous safety and quality control programs while building for the Department of Defense and know how to run a job site. We know how to work safely in low tolerances and close to the airfield. Simply put, we can operate around an airfield. Our safety record reflects our thorough preparation and total dedication to safety. Our job sites are often located within active airfields, a work environment that requires an experienced team capable of effectively managing the unique set of challenges associated with this type of specialized construction. We work closely with both Airfield Managers and the FAA in obtaining permits, making certain all specific airfield and FAA requirements are met. On site, we are in continuous communication with the airfield officials and control tower to coordinate personnel and equipment, ensuring there are no flight line conflicts and that construction activities do not interfere with any type of airport traffic. At The Korte Company, we use an innovative, Design-Build project approach, bringing together a hand-selected, multi-disciplined team to get the job done. By bringing together all project participants from the start, our team approach fosters the development of best-value solutions, saving you time and money while ensuring you get the highest quality facility. Throughout the process, our Design-Build approach provides numerous advantages. For example, due to their extreme weight requirements and FAA permitting requirements, hangar projects require smart procurement and project planning. Some projects require ultra-heavy-duty materials, such as specialty steel I-Beams that are only manufactured once per year by certain steel mills. With our approach, we bring together the full project expertise to anticipate and plan around all material procurement and permitting needs. Our approach also allows us to fast-track even the most complex hangar construction projects by beginning earthwork and steel erection during the last stages of design. Through the years, we’ve delivered more than 3,000 projects nationwide, including a wide range of hangar construction projects. On each and every one, we ensure our clients are satisfied — more than 84 percent of our business comes from repeat business. But don’t take our word for it. Take a look at our project portfolio and read testimonials directly from our clients. This in-depth guide is meant to walk civilian and military customers through the stages of these unique jobs. Topics discussed include the main drivers of hangar construction costs and the unique issues you’ll likely encounter during hangar construction projects.